When people first start doing genealogy and being to research their family surnames, most of them are smart enough to realize they must divide and conquer. They start with two files: one for their mother's family and one for the their father's side. So very organized, how wonderful! Warning. This is not enough dividing! At the minimum you need four files, one for each set of great grandparents. In fact, this is what FamilySearch has also decided is the least you should do. 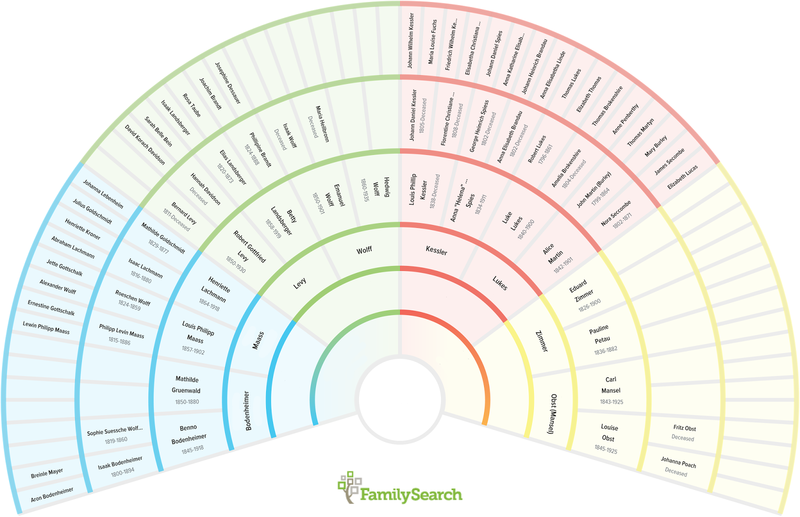 FamilySearch has a really nice fan chart that is automatically created for you, once you've fine-tuned your tree on their site. This fan chart includes color coding for four families, and your best bet is to use it. As you progress, you'll realize that what you really wanted along was eight files, one for each set of great great grandparents! These are the eight families that I'm tracking. What I like about having eight folders is that it really separates out the lines nicely so that you can fully concentrate on just one part of the tree. There are more personal reasons to divide them into eight. My grandmother's cousins don't care that much about her husband's family, so that means at least four groups. I mean they care about me and my cousins and uncles and all that, but they really don't care that I've traced my grandfather's mother's line way way back to wherever -- they simply don't share any DNA with them. I've set up mailing lists, Facebook groups, and family reunions and it's always a challenge to make sure they right people are invited -- ones that will care about each other, or something simple like that. With eight groups, you really dial in on the family that wants to know more about that line. Once you get back to great great grandparents, there is usually enough long lost third cousins, second cousins, and cousins that you should have enough people to talk to without annoying anyone. If you look at the red area in the photo above, you see the Kessler and Lukes families together. Well, if it wasn't for a single marriage that I care an awful lot about, those two families would never ever know about each other. Having them in a single group means that I am always sending out stuff that doesn't matter to half the people. Concentrating on eight also really helps with DNA research. If you only test yourself, you will be completely overwhelmed with hundreds of matches that you can't figure out. You need to find some third cousins, or your parent's second cousins, so you can get eight tests done to make the most of your DNA matches. Again, dividing into eight lets you find one potential test in an organized manner, color coded for your listening pleasure. Divide and conquer, and follow the FamilySearch color scheme. Why not?